The Governor of California Jerry Brown is furious with President Trump for stepping aside from the Paris Climate-Change accord. In an angst-ridden outburst Mr Brown reckoned habitats will be destroyed, we’re all going to die and insects will take over the Earth. I once flew across America in a daylight flight from California to Florida. From my window seat I was keen to observe civilisation from 29,000 feet, but all I saw was wilderness. We flew over no cities and I concluded that America looked more like Davy Crockett’s version than Jerry Brown’s. It’s possible that if you draw a straight line from Los Angeles to Miami you actually don’t pass over any inhabited areas, but after that flight I was curious to know just where 300 million citizens lived. It seemed to me that given the vast greenery below me there was ample vegetation to absorb the carbon dioxide these undetected people produced to be turned into oxygen in the photosynthetic process. And so I have become a bit of a global-warming sceptic. I tend to empathise with New Zealand’s two great climate-change-denying “scientists” Mike Hosking and Leighton Smith who have apparently abandoned their laboratories and Bunsen burners in Auckland and taken up broadcasting on Newstalk ZB. The trouble for us more mature citizens is that we’ve witnessed authorities cry wolf before. Since the 1970s here’s the track record on doom: the population explosion would be unstoppable, global famine would be inevitable, crop yields would fall, a cancer epidemic caused by pesticides would shorten lifespan, the deserts would advance by two miles a year, rainforests would disappear, acid rain would destroy forests, oil spills would worsen, oil and gas would run out, and so would copper, zinc, chrome and many other natural resources, America’s Great Lakes would die, dozens of birds and mammal species would become extinct each year, a new ice age would begin, sperm counts would fall, mad cow disease would kill hundreds of thousands of people, genetically modified weeds would devastate ecosystems, nanotechnology would run riot, computers would crash at the dawn of the millennium bringing down civilisation, the hole in the ozone layer would cause blindness and cancer on a huge scale. I’ve just scratched the surface of the doomsday predictions, but these melodramatic forecasts are what fuels green political party participation. 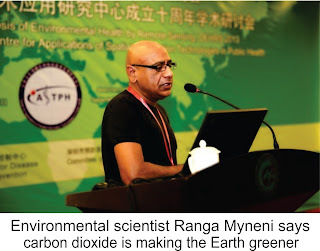 However environmental scientist Ranga Myneni of Boston University says that data from satellites is proving that much of the planet is getting greener and overall in the last 30 years there has been roughly 14 percent increase in vegetation on planet earth. Myneni said that about half of this greening was a direct result of rising carbon dioxide levels in the atmosphere, as along with water it is the raw material that plants use to make carbohydrates. This will be news to those accustomed to alarming tales about deforestation, overdevelopment and ecosystem destruction. Meanwhile Governor Brown has gone off and signed a climate-change accord with China. Ironic when you consider the Paris agreement allowed China to increase its CO2 emissions. Oops, a giant grasshopper is about to devour my computer.